No one has mastered the art of the Frankenfood quite like Taco Bell. The beloved fast food chain has made a habit out of unleashing seemingly preposterous mashups of its most popular menu items, and delighting hungry fans -- if only temporarily -- with ridiculously delicious offerings like Nacho Fries, Naked Chicken Chalupas, and Quesalupas. And now, T-Bell is making yet another wild and crazy new option to tempt your taste buds: a Mexican Pizza Crunchwrap. 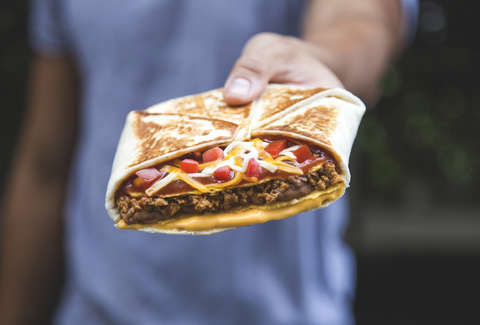 The latest stunt food to make it out of the company's insane development lab, the Mexican Pizza Crunchwrap is exactly what it sounds like: a full traditional Mexican Pizza with seasoned beef, refried beans, tomatoes, three cheese blend, and Mexican pizza sauce stuffed inside a grilled flour tortilla. In other words, it's a handheld version of the regular Mexican Pizza, aka a dream come true. However, unless you feel like trekking all the way to Oklahoma, you won't be able to get your hands on one quite yet. That's because this special Crunchwrap is currently in the testing phase, and only available in select locations around Oklahoma City. Of course, Taco Bell regularly tests new menu items like this before deciding whether to offer them nationwide. Presumably, they'll need to see that this one's popular enough to justify bringing it to the masses, so if you want to see it hit menus everywhere it's on you to do your civic duty and call everyone you know in Oklahoma and ask them to buy a gluttonous amount of Mexican Pizza Crunchwraps.